Well it has been a long time since I did a workshop, classes yes, but a workshop. 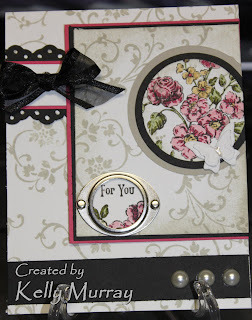 Time to get back into practise, here is one of the cards we will be doing that day. Just thought I would share. It's so pretty Kelly, has a real elegant feel, you must be busy! Wow Kelly this is stunning what gorgeous colours I so love the flower image I agree with Lori this is very elegant.